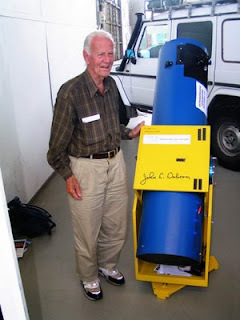 One sunny, summer afternoon, I stumbled across a particularly curious character, John Dobson, the creator of the Dobsonian telescope (both shown in the associated photo) and noted founder of the Sidewalk Astronomers group. The first time I encountered Dobson was on a sunny weekend afternoon in December, 1996 when he was teaching a class on how to build a telescope, a Dobsonian telescope of course. The class included instruction on mirror grinding, not a trivial task! The class was conducted on the front lawn of the Griffith Observatory in Los Angeles. He was with a dozen or so participants as they were in the middle of the arduous job of grinding the mirrors. He was barking out instructions and scolding an attendee who wasn’t, in his estimation, using enough “elbow grease” so he yanked the mirror away from the student and did it himself. Dobson is a distinctive character, a nonagenarian, long gray hair in a pony tail, and rail thin. After hours of hard labor, the fruit of the exercise, the finished product, was a complete Dobsonian telescope. I think every serious amateur astronomer should build their own telescope under John Dobson’s tutelage. Dobson is known for traveling around the country, giving lectures, visiting astronomy groups, and being a follower of the Indian Vedanta religious philosophy. Early in 2007, Zoe, my girlfriend and science companion extraordinaire, and I decided to seek out Dobson. We found out that he was staying for a period at a monastery in Hollywood so we called to invite him to dinner. We had heard that folks support his efforts in lecturing and travel by subsidizing him. He’s a pretty elderly chap, but with a quick wit and much energy. When we picked him up we gave him his choice of restaurant. He chose Denny’s. When we sat down and ordered, he asked the waitress to bring him “something green.” Our dinner was interesting to say the least, moving quickly from topic to topic in astronomy and astrophysics, and even some spirituality and mysticism thrown in for good measure. Just before we drove him back, he allowed Zoe and me to borrow an original manuscript of a new book he had written, “The Moon is New,” a mélange of physics and mysticism. We felt quite honored that he entrusted us with his book, so we quickly read it, and Zoe promptly returned it to him. It turns out that you can meet all sorts of curious characters in science if you simply extend them an invitation of some sort. In the future, I envision inviting all sorts of scientists over to my home for a home cooked dinner and rousing science discussions. So can you, give it a try.